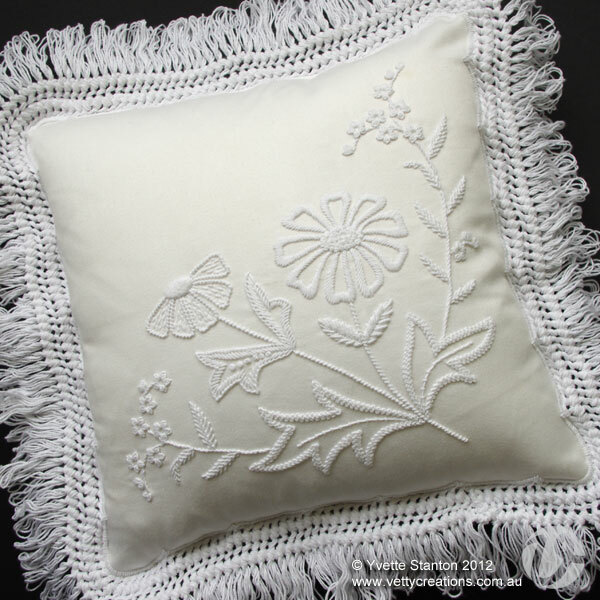 Mountmellick embroidery is a style of floral whitework embroidery from Ireland. It uses white thread on white fabric and a range of knotted and padded stitches to create rich and sumptuous embroidery. The knitted fringe is a traditional edging. We will be creating a cushion with a pretty design featuring daisies and forget-me-nots. All stitches will be taught in class, and a demonstration of the traditional knitted fringe will be given. This two day class is suitable even for people who have never tried embroidery before - all skill levels are welcome! The embroidery stitches will be learned and the cushion embroidery started in class. Cushion construction and knitting will be done in your own time following the class.